Love this time of the year where family and friends get together; where everyone seem to forget their problems and simply enjoy that moment in time. For these upcoming holidays, setting a casual table (specially for Thanksgiving) can be an easy and affordable task if we try to mix-and-match new pieces with some that we might already own. Including small personalized details is always a nice way to say “thank you” and “welcome” to our guests. Indoor gatherings are a great and intimate way of having company. But, I like setting the table in our patio because of that fresh and relax feeling that the surroundings provide. For this table I wanted a statement piece to place in its center. I found from BHG at Walmart the perfect accessory; a pumpkin dispenser (available at stores)! But I wanted it to stand out even more, so I added a flower vase inside for a dual purpose. I prepared in advance a flower arrangement and before placing it inside the dispenser (after cleaning thoroughly the its outside), I surrounded it with plastic wrap making sure nothing would fall into the water. You can see this full tutorial here. After placing this arrangement over a cake stand to add more height, I started setting the plates.For this I used some old melamine dinner plates I’ve previously bought from BHG at Walmart (see how I’ve used these in the past here). Because these are a soft white color they will go with any combination, so I decided to add interest by combining them with some faux wood chargers and some gray and white salad plates from the new Ashmore dinner set available at stores this Fall 2016 from BHG at Walmart. 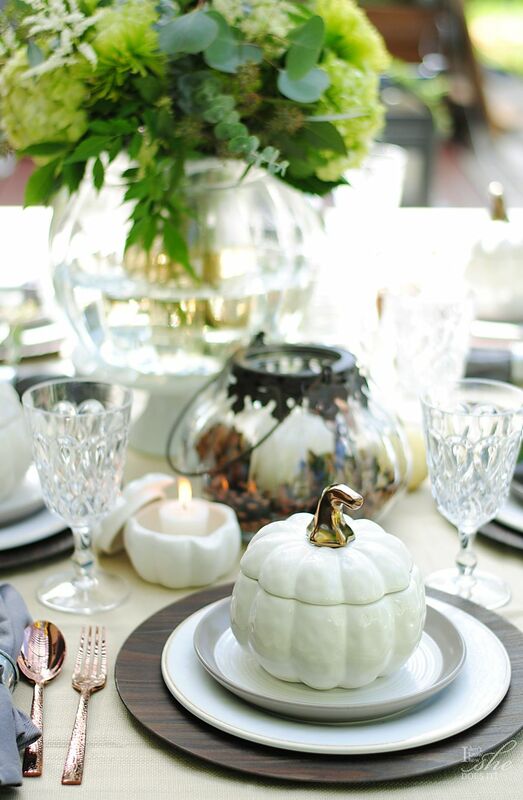 Some pumpkin soup bowls were also the main protagonist in this table setting. Love their metallic copper handles which add a bit of elegance to the piece and the entire setting as well. To add a personalized touch to this table setting, I found a banner set with 3 galvanized pieces with clips. They were joined by a small rope and I just untied the knot and used them individually as menu holders. To hang them, I used a simple branch of eucalyptus which I carefully passed through the existing holes. You can see how I did it here. Sometimes the simplest materials can be of great impact when decorating. Having plants and/or items that simulate natural elements also serve as great accessories helping in achieving a relax and fresh look. Hope you’ve enjoyed this table setting and that these tips would help you with the upcoming holidays. For your next family or friends event, are you using accessories you already own, or mixing-and-matching those with new ones? Share with me your ideas! So beautiful and creative! Love it all! Sooo beautiful and so you, Gloribell. I love it all, especially that centerpiece. Thanks Debbie! I'm happy you did. Thanks Monica! I love how this turned out!